I hope you are not thinking that I have stopped posting. This is not the case. We are experiencing an outbreak of the flu, and family matters have taken priority at this moment. I assume we are not the only victims of this nasty virus. So here is some music that will certainly cheer you up, and that even may transform a burning fever into a feeling of rosy intoxication. Should you -once you have vanquished the infectious enemy- wish to be informed about the background to these wonderful recordings, I advise you to visit the blog of the Voice Of America. 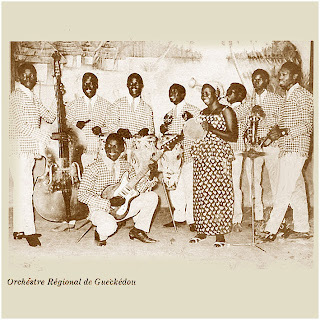 The music is brought to you by the Orchestre de Danse from Gueckédou, better known as the Kébendo Jazz. According to the label the recordings for this (Tempo LP-7013) and the second (Tempo LP-7014, subject of a future post) record were made in 1961 and released in 1964. By then the orchestra had triumphed in the 1963 edition of the Festival National des Arts et de la Culture, - the first festival to have a competition for orchestras. I especially like the dreamy boleros ("Sewara", "Bessawa" and the classic "Mama"), with the matching falsetto of Mamady Traoré. With this music, you may even enjoy having the flu! This a quick post. Having already posted the second volume of the wonderful Touba Auto K7's featuring Number One de Dakar, it's time for the first volume. I refer you to Aduna's site for more cassettes from the same remarkable label, and, if no one else will, I will post some more volumes of other orchestras in the (not too distant, if I can find more time) future. Strangely, two tracks of this volume ("Adouna" and "Guantanamera") were repeated on the second. Apart from a difference in speed, which may be due to the physical condition of the tapes, I think the tracks are the same. And the last note of "Mambay Fary" is missing, which may suggest that my copy is a pirate version. But it's still a very enjoyable cassette. By the mid-1970s Franco was in full control of his orchestra. He had called an end to the coming and going of musicians; once a musician left the Tout Puissant O.K. Jazz there was no coming back. He attracted talent from the 'competition', i.e. from the orchestra in the African Jazz school: in 1973 Josky Kiambukuta (who had been a singer with Docteur Nico's African Fiesta Sukisa), in 1975 Ndombe Opetum (ex-African Fiesta National) and in 1976 Ntesa Dalienst (who had made his debut in Bombenga's Vox Africa). The aim was to widen the scope of the orchestra, not just to attract a larger audience, but also to diversify the musical potential. Because Franco himself found that the OK Jazz style was getting a bit monotonous. Sam Mangwana had a special arrangment with Franco. He had been contacted long before he joined the orchestre, and was posted as a 'mole' with Rochereau's African Fiesta,and to learn the trade with the competition. When he finally teamed up with Franco in 1973 (first tracks: "Où est le sérieux?" and "Ebale Ya Zaire") he was free to operate outside the OK Jazz. With the OK Jazz his primary role was that of an 'interprète', for which he received a solid 15 percent of a song's revenue. Another person to maintain a special relationship with Franco was Mayaula Mayoni. He had been a football (soccer) player with Franco's favourite team, Vita Club. He never became a member of the orchestra, but often performed with the OK Jazz as a rhythm guitar (guitare d'accompagnement) player. Also he contributed some memorable composition, the most famous being "Chérie Bondowe". Here are some 45's from the 1970s, including two superb compositions by Mayaula Mayoni and a classic track featuring Sam Mangwana. Two of the tracks are probably from 1973. 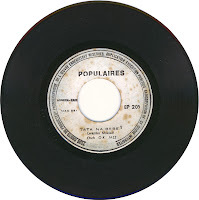 The first of these "Tata Na Bebe" (Populaires EP 205) is a showcase of the vocal talent, with lead parts from Sam, Josky, Michel Boyibanda and composer Franco. Youlou Mabiala's slightly earlier "Massi" (Populaires EP 203) is sung by the 'old crowd': Youlou, Boyibanda and Lola Djangi 'Chécain'. "Na Koma Mbanda Na Mama Ya Mobali Na Ngai" (African 91.247, but also released on CD 36571) (which according to Gary Stewart translates as "I've become my mother-in-law's rival") was composed by Franco and recorded -together with Mayaula's "Chérie Bondowe"- in 1976, and was selected best song of 1976 by the readers of the Salongo magazine. The singers are the same as "Tata Na Bebe", but in a very different role. The other tracks were all released in 1977 (but I suspect some were recorded earlier). The first of these is the brilliant "Bondoki" (African 91.434, but originally released on Mayaula's own Zebi label) ("sorcery"), with Josky, Youlou and Wuta Mayi singing and Franco doing some nice shuffles on his guitar. The second is Josky's "Mobali Amesana Na Ngai" (African 91.463), with Josky backing Youlou and Franco intervening as lead vocalist. The third is another classic by Mayaula Mayoni: "Mitelengano" (African 91.474). I am not too sure about the singers in this track. I suspect Wuta Mayi and Chécain, and maybe Boyibanda. The final of these 45's is Simaro's "Makambo" (African 91.558), as with many compositions by Simaro a complex arrangement with Josky and Ndombe singing, backed by Wuta and -I supect- Ntesa Dalienst. Finally, here is a small excerpt from a show by the TP OK Jazz on Zairean television. It is probably from 1975. It is part of a track composed by Simaro, "Oko Regretter Ngai Mama" (translated by Simaro as "You will regret me one day, woman"). There are some wonderful closeups of Chécain, Boyibanda (with his typical way of dancing) and of Josky (left) and Wuta Mayi, plus some great shots of Franco 'directing' the orchestra. There seems to be a technical problem with some of the files hosted at Mediafire. I have asked their support team to help me out. EDIT: the problem appears to have been resolved (and very rapidly too!). 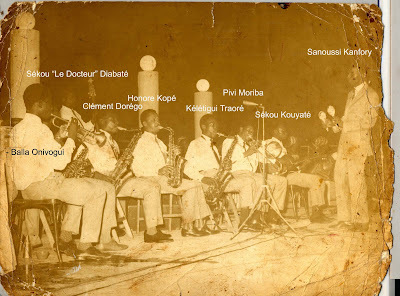 The Koulé Star, orchestra of the cercle of Koutiala, was founded in 1958. 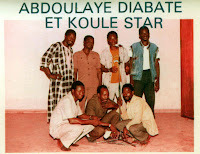 They never rose above the level of local fame, until in 1976 they managed to convince Abdoulaye Diabaté to join them as a singer. Abdoulaye Diabaté is originally from Zinzana, a village not far from Ségou. His father, Baba, was a 'furuboloma', a griot who acts as a marriage intermediary and organiser, and his mother Assitan Dembélé, a well-known singer in the Bambara tradition. Although Abdoulaye started singing as a young boy of eight, he was hesitant to choose singing as a career, and instead preferred to finish his studies to become an accountant. Having completed a two-year study in Bamako, he travels to Koutiala in 1972 to start a job as an accountant. Caught by rain and thunder on his arrival, an older lady, Mamou Diallo, offers the tired traveller shelter and food. As she is the jatigi (host), she claims Abdoulaye (being a Diabaté - i.e. from a griot family) as her griot. Abdoulaye agrees to this. As her griot he subsequently studies the lineage of Peul families (Diallo is one of the Peul families). But his main occupation remains the job as an accountant. He doesn't perform in public, until Mamou Diallo asks him to compete in a competition between quartiers. He contributes five songs, and his quartier wins the competition. 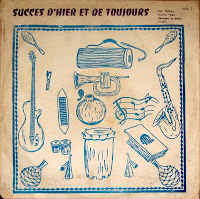 A year later, in 1976, the lead vocalist of the local orchestra, the Koulé Star, doesn't show up at a concert, and Diabaté is persuaded to join them, - initially for one concert, but after the huge success of that performance, and after consulting his employer ànd Mamou Diallo, as a permanent member. 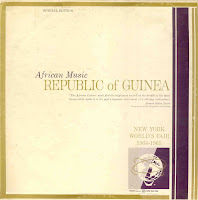 In a future post I will focus on Abdoulaye's association with the regional orchestra of Sikasso. But for now, here is a cassette which the Koulé Star released in the 1980s. I bought it in 1988, but I am sure the recordings were made earlier. Unfortunately, as with the cassette I posted earlier, the quality is rather poor. This is not due to the cassette itself, but to the recording. The cassette has been recently re-released in Mali and this re-release has the same flaw as the earlier version. The music itself is, however, brilliant and the cassette is one of the many classics of Malian music. Again I am surprised. 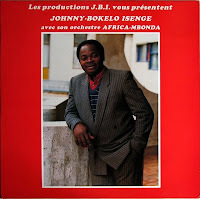 This time about the lack of information about Johnny (Jean) Bokelo on the internet. From Gary Stewart's "Rumba On The River" one might get the impression that he was constantly fighting with record companies. But, luckily for us, he has also found time to produce some great records. 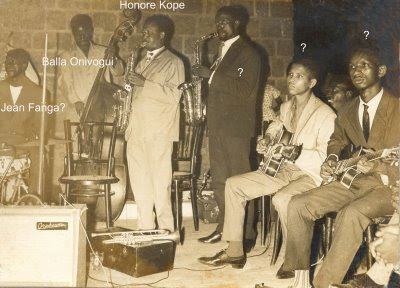 Bokelo started (as far as I can ascertain) his musical career at the Loningisa label, where he recorded his first compositions in February 1959 (I'll post those tracks later, in the Loningisa series of posts). Via Conga Jazz, Conga Succes, Conga De La Capitale, Conga 68 and Conga International (and there may be other variations) he ended up in the 1980s with his orchestre Mbonda Africa. A start of a discography can be found at this forum. If there is any call for it, I will post some of his Editions Mbonda singles later. Here, however, is the album from 1983 which Bokelo released on one of his own labels. 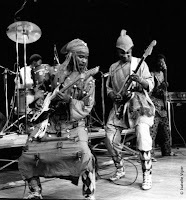 It is a great example of Bokelo's heavyweight soukous, with solid male vocals, multi-dimensional horns and classic Bokelo guitars. Some time ago a friend drew my attention to this passage in Banning Eyre's book "In Griot Time" about Dounanké Koita. "Dounanke was raised in a family of musicians in a town called Tominian, east of Segu in Bobo country. He came to Bamako as a boy, and after many years of playing in wedding bands and as a support man in Manding and Bambara pop groups, Dounanke made his name at the age of thirty-five when he released his first cassette. The cassette was a rare recording of music from the Bobo, a people who straddle the borders dividing Mali, Cote D'Ivoire, and Burkina Faso. 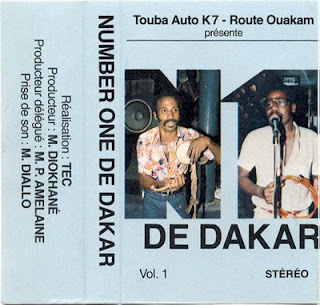 That first cassette was produced, like so many succesful Bamako debuts, at Philippe Berthier's Studio Oubien, and it won Dounanke considerable play on radio and television at the time. But that was in 1992, and he hadn't followed up with a new release. "For now", he told me, "we do our work in the bars"." I think he is selling Dounanké short when he writes about his history before recording this cassette. Because Dounanké was a respected rhythm guitarist with the Super Djata Band. One of his tracks, "Tindoro", features on the CD version of the Super Djata (studio) album. That version was instrumental, but during concerts the track was sung by Dounanké himself. Here is the track as it was performed in Amsterdam on November 11, 1985. 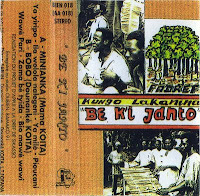 I assume the cassette Banning refers to is the one with Dounanké on one side and Mama Koita on the other. The focus on the Mama Koita side is (as with Molobali Keita) on the Minianka music in which the balafon plays a major part. The side of Dounanké features Bobo rhythms, with Dounanké (as in "Tindoro") on talking drum. If I remember correctly, it was some time during the mid-1980s that I found the "South African Jive" series of cassettes of which this is the first (of five). I admit it took me a while to get a taste for the music. But over the years it has grown, not just because of the music itself, but also because of (my understanding of) its historic value. I was under the impression that we were going to be flooded with South African music from the 1950s and 1960s after the demise of the rule of apartheid. But a decade and a half later, I think I can safely say that instead of a tsunami we have seen no more than a trickle. Of the Dark City Sisters nearly a full CD has been released (Earthworks - CDEWV 31). This vocal quartet from the township of Alexandra (nicknamed "Dark City" because of the absence of electricity and street lighting - more here) was led -from the start in 1958- by Joyce Mogatusi, who was originally from Botswana. 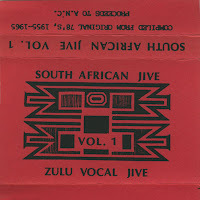 The Dark City Sisters feature in seven of the eighteen tracks of this cassette (two of which are also on the Earthworks CD), and Joyce Mogatusi has two more tracks with saxophonist Boy Masaka. The other half of this cassette features four tracks by the Flying Jazz Queens, who also have two tracks on the Earthworks compilation (one of which is also on this cassette), two by Intombi Zodwa (Xhosa for "girls only") and one each by the Travelling Sisters, the New Farm Sisters and (Alexandra?) Black Mambazo. 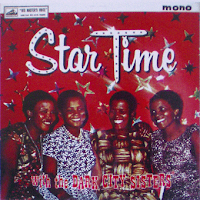 My favourite tracks are the two by the Dark City Sisters backed by the wonderful swinging Transvaal Rocking Jazz Stars. Especially "Tomati Yo Yo No.3" is a track which is rooted in my memory forever. "Ulwandhle" by the Flying Jazz Queens is another qualifier for the catalogue of all-time African classics, as is - of course - the great "Langa More (Tap Tap)", which features (the late) Simon 'Mahlathini' Nkabinde. PS: much more about South African music can be read in Matt's blog. And I see Likembe also has a post about South African music. I shouldn't be posting this now. It's cold outside, here in Holland, and most Dutch people are thinking about skating and other 'wintry delights'(brrrrrrr). I prefer to dream away with this wonderful cassette by the Super Star de Dakar, featuring the voice of Laba Sosseh and the sax of Dexter Johnson. Ahh, that's more like it. I'm getting warmer now. A little salsa? - Okay. "El Dengue"? - Let's get wild! Graeme Counsel has sent me three photos of the first Syli Orchestre National, which I would like to share with you. He is trying to identify the musicians in these photos. Some of these have already been named by Balla (of Balla et ses Balladins), but others remain a mystery. Honoré Kopé should be Honoré Coppet, a musician from Martinique, who we suspect to be the star of biguine music from the 1940s and 1950s, and who had his own orchestra in Guinea in the early 1960s. Sanoussi Kanfory was the first chef d'orchestre. The sax player next to Honoré Coppet has been identified as Mamadi Kourouma. If anyone can help, please comment on the post or mail to Graeme. This post is about Franco's first steps into professional music. I gladly refer you to Gary Stewart's "Rumba On The River", which is very detailed about this period (and is highly recommended in general). A key figure in this early part of Franco's career is Paul Ebengo a.k.a. Dewayon. I'm still looking for someone to translate this excerpt from a documentary about the "birth of the O.K. 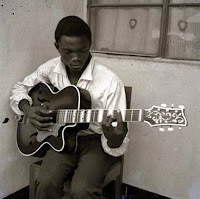 Jazz", but other sources seem to confirm Gary Stewart's description that young François Luambo learnt the first chords on the (acoustic) guitar he 'borrowed' from Dewayon. Dewayon, who came from a relatively well-to-do family and was four years older, acted as a kind of big brother to the timid Franco. 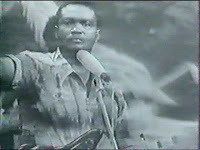 Albert Luampasi, who lived in the same neighbourhood of Léopoldville, was a musician with the Ngoma label and performed with his own group. He allowed the children of the quartier to come and watch the rehearsals at his house. And, as he owned several guitars, he let them practise and showed them some chords. Seeing the eagerness and the talent of the two boys, after a while he even let them join his group when he played at so-called 'matangas' (meetings of mourning). Franco even participated in the rehearsals for the track "Chérie Mabanza" (Ngoma 732) which Luampasi sings in this video. Luampasi, who mainly sung in the kikongo language, stopped recording in 1957. Eventually (I suspect it was a little later than 1950 - as Gary Stewart writes) Dewayon formed his own group which he called "Watam" (derived from "watama", which means something like "layabout"). In 1953 they auditioned with Henri Bowane (who had switched to the Loningisa label) and were taken on. Dewayon's first composition for Loningisa was "Nyekese" (Lon 100, on CRAW 4), recorded February 5, 1953, with the B-side "Bokilo Ayebi Kobota" ("Ayebi Kobota" on CRAW 10). After that, in August the same year, "Tuba Mbote" and "Esengo Ya Mokili" (Lon 111, on CRAW 10 and 4), and -probably in the same recording session- "Bikunda" and "Group Watam" (Lon 112). In October they recorded two more compositions by the then 19-year old Dewayon: "Naino Ngai Nakufi Te" and "Bana Bosenge" (Lon 120, the latter on CRAW 10). A month later saw the debut of a musician from Brazzaville, bassist Daniel Lubelo, who called himself "De La Lune", with the compositions "Marie Kanisa Ngai" and "Bitumba Mabe" (Lon 121). 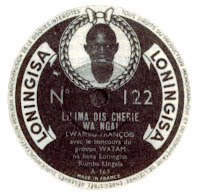 And twelve days later, on November 17, 1953, Franco recorded his first composition: "Kombo Ya Loningisa", followed a day later by "Lilima Dis Cherie Wa Ngai" (Lon 122). This last song evoked quite a few chuckles among those who knew the 15-year old, as it was about Franco's first girl friend, and the shy Franco certainly didn't have a reputation as a womanizer. Nearly two years passed before Franco's next composition was recorded. The delay was not due to Franco, but to the Loningisa studio moving and the lack of recording activity. Only 6 records were recorded for the Loningisa label between November 1953 and October 14, 1955, when Franco entered the studio, and with him a new singer: Philippe Lando, who was better known as "Rossignol" ("nightingale"*). Backed by Franco, Rossignol sung "Bayini Ngai Mpo Na Yo", which in the literature is sometimes called "Bolingo Na Ngai Na Beatrice", and "Marie-Catho" (Lon 129). Both compositions were credited to Franco, but this got the Loningisa label into some trouble, as the melody for the first track was taken from a song titled "Mélodie Mexicaine" by the French duo Patrice and Mario (personally I don't hear the similarity...). By the way: not Béatrice, but Marie-Catho was Franco's girlfriend. Rossignol would later state, as Ntesa Dalienst recalled, that Franco was the best backing vocalist he had worked with. The songs established Franco as a composer. A month later he recorded "Flamingo" and "Veronica Wa Mboka Bukligham" (Lon 134), the latter about another girlfriend who had deserted Franco. After this track Franco decided he wouldn't sing about girls anymore, as the subject provoked too many rumours. 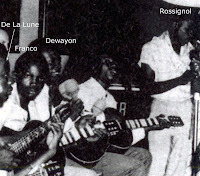 A few months later (March 1956), with the next recordings, the outlines of Franco's early guitar style were getting clear in the "boogie woogie cosmopolite" "Elo Mama" and the already quite mature "Naboyi Yo Te" (Lon 138), both featuring Franco singing the backing vocal next to Rossignol's falsetto. In the same month Victor 'Vicky' Longomba joined the Loningisa label. After the CEFA label had gone bankrupt in 1955, he had worked in a factory for a bit. His first compositions with Loningisa, "Mokili Mobongwani" and "Nalingi Ozonga" (Lon 140), are also the first songs with Franco. In the next post about the early part of Franco's career I will focus on the birth of the O.K. Jazz. A file containing all the Loningisa tracks in this post can be found here (but you can also download them individually). Judging by the comments on the first post of this concert by the legendary Syli Orchestre National from Guinea, there seems to be some uncertainty about the musicians participating. I am certainly not qualified to express an opinion, but I can try and help. Not just by sharing this video, but also by posting some photos from another version of this same video. The latter is from a commercial video cassette titled "Justin Morel Junior présente L'Afrique en Fête" (JMJ Video KV 1950). Unfortunately the video shows little respect for the historic value of the images, because it contains more video effects (strange whirls, zooms, cross-fades and such) than clear footage. And it also breaks off after just over 6 minutes! But these minutes are precious, as I am sure you will agree. I tend to get very annoyed with all the releases stressing western aspects of African music. "Nigeria Disco Funk", "Afro-Rock", various West African Funk compilations and such. I can understand the need for these from an African point of view. But the strange thing is: most of these compilations are put together by western producers, and for a western public. It's like those people that travel to the other side of the world for an exotic holiday, but take their own local brand of coffee. 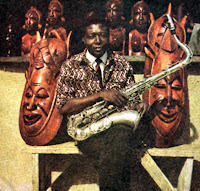 So in this post I am sharing with you an African compilation of music from Benin. I find no mention of "funk" or "rock" on the sleeve. And if you ask me, I can only hear music with obvious African roots. With rhythms borrowed from the traditional (vodun and other) music. PS: apparently the last two tracks on the B-side have been switched around on the sleeve. The last track is clearly Gnonnas Pedro. I wish a very happy and healthy 2009! To begin this new year I have dug up some tracks from one of my favourite artists from the 1950s Congolese music: Léon Bukasa. Born in 1925, in the town of Likasi in the Katanga region of Congo, Bukasa left primary school, not to go into music, but to start an apprenticeship as a fitter with the Union Minière. Even his move to the capital Léopoldville, in 1947, wasn't inspired by his wish to become a musician. He had found a job as a master fitter. The tracks I am posting here are from the period between 1954 and 1957. Of the first three tracks I can't trace the catalogue number. And of the first I don't even know the title. This track features the Greek solovox (organ) player Pileas, who also played in the famous 1951 ode to Nico Jéronimidis "Tokanisa Tata Ngoma" (on pamap 101). Bukasa sung in three languages: lingala, (ki)swahili and tshiluba. The second track, "Kuwata webe munsha", is in tshiluba and the third, "Bertha roho mbaya", (featuring some great banjo playing) in swahili. The next two tracks "Rumba Soupareto" and the superb "Bonne Année"(!) were released in 1954 as Ngoma 1496, and are both in lingala. 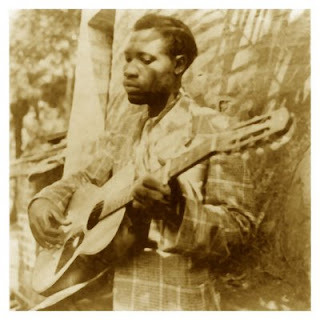 The sixth track, "Balitaka kunifunga kweli", is the B-side of "Bibi Bertha Mosoko" (Ngoma 1707 from 1956 - on pamap 101). And the final track, "Simplice wa bolingo", is the A-side of "Bibi Sultani"(Ngoma 1824 from 1957 - on pamap 101*) and features the young Papa Noel (Nedule) on guitar. I think this record was the third Papa Noel recorded with Bukasa. I am just crazy about the saxes on this track. 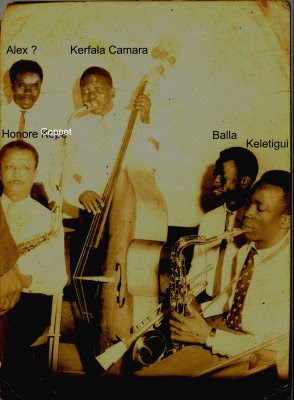 I suspect the second sax is from Albino Kalombo (on the photo from 1955 on the left. Bukasa is second from the right). *according the notes accompanying this CD the catalogue number was 1786; it is possible that Bukasa released this track more than once, in different languages. 1824 is, however, the swahili version.